Whether you prefer smoky Ancho chilies or spicy Thai chilies, they’ll both make a kicky finishing oil for risottos, pastas and seafood. 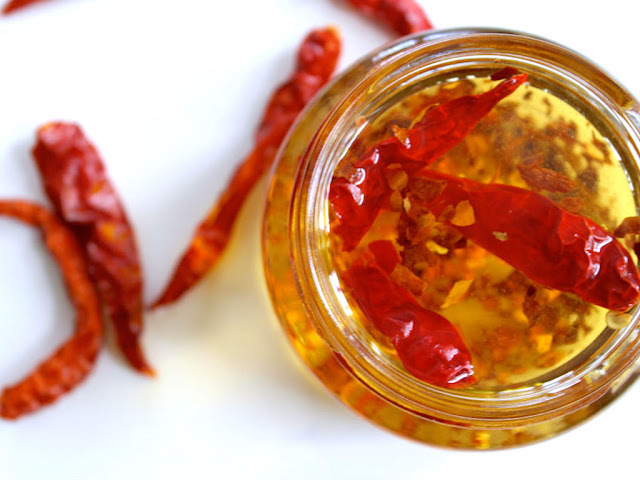 Chili oil is essentially dried chilies, preserved in oil. It adds a delightful kick to whatever dish you’re using it in. Commonly used as a finishing oil for risottos, pastas and seafood, it’s also a great oil for any stir fry or sauté. As you’re about to learn, making chili oil is very easy. Using it however, requires a little more consideration. Fresh chili oil — or chili oil that has just been made — will be relatively mild. But once the oil is stored, the chilies will continue to release heat. Rule of thumb? Test your oil before using: A little goes a long way. The variety of chili you use will also impact the flavour of your oil. A dried Thai red chili will have an acute spiciness to it, whereas an Ancho chili will be spicy with a hint of smokiness. Decide what flavour you’re looking for when you’re selecting the chili. HEAT 2 tbsp oil in a saucepan over medium heat. Add chili flakes and whole chilies. Cook, stirring, until chilies start to gently sizzle, about 1 min. *If they begin to brown you’ve gone too far and will have to start over. ADD remaining oil to pot. Heat until oil is warmed through, but not too hot to touch. Remove from heat and let cool to room temperature. STORE in an airtight bottle or jar. Shake occasionally to disperse the chilies. Originally published May 12th, 2015. Updated February 2018.